The Power opens their 2019 home schedule from April 11-17. 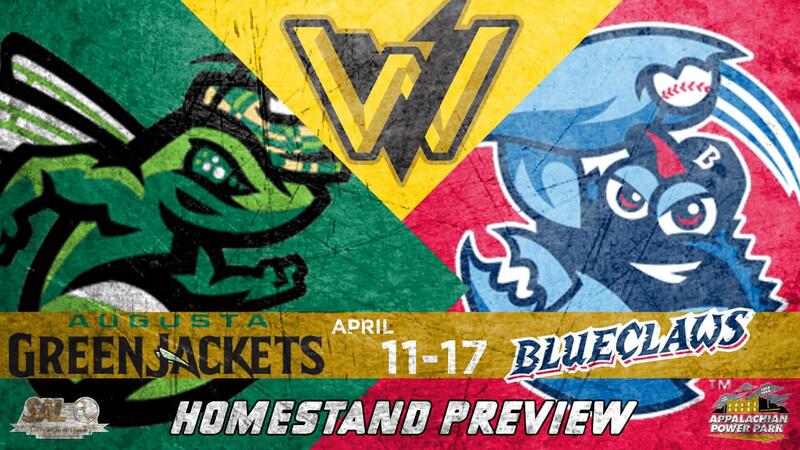 CHARLESTON, W. Va. (April 10, 2019) - The West Virginia opens its 15th home season Thursday, April 11, at Appalachian Power Park, as they welcome the Augusta GreenJackets and Lakewood BlueClaws to town for a seven-game homestand. The Power's opening home stretch is jam-packed with promotions, including the return of several weekly promotions revamped for 2019, along with several exclusive giveaways and the start of our GetGoWV summer concert series. Thursday, April 11 vs. Augusta GreenJackets - 7:05 p.m.
Friday, April 12 vs. Augusta GreenJackets - 7:05 p.m.
Saturday, April 13 vs. Augusta GreenJackets - 2:05 p.m.
Sunday, April 14 vs. Augusta GreenJackets - 2:05 p.m.
Monday, April 15 vs. Lakewood BlueClaws - 7:05 p.m.
Tuesday, April 16 vs. Lakewood BlueClaws - 7:05 p.m.
Wednesday, April 17 vs. Lakewood BlueClaws - 10:35 a.m.
ABOUT THE GREENJACKETS: The Augusta GreenJackets enter 2019 re-tooled with some of the best pitching talent in the San Francisco Giants' system, including five of their top-30 prospects. Headlining the GreenJackets' pitching core is Sean Hjelle, a dominant University of Kentucky product who ranks sixth overall in the Giants' system. Augusta will wrap up a stretch of 11 straight games on the road when they head to Appalachian Power Park from April 11-14 before opening their home season at SRP Park against Greensboro April 15. ABOUT THE BLUECLAWS: The overall winners of the Northern Division last year and the South Atlantic League runner-ups, the Lakewood BlueClaws come into 2019 with a new coaching staff and whole slew of new players. After most of their pitchers from 2018 elevated in the Phillies system, Lakewood received two of the top hitting prospects on their 2019 Opening Day roster, including 2018 third overall pick Alec Bohm and GCL 2018 batting champion Luis Garcia. Bohm is the top prospect in Philadelphia's system, while Garcia is slotted in at third-best. New manager Mike Micucci leads the group, including Garcia and Victor Santos, who are the first two BlueClaws in team history to be born in the year 2000. OPENING NIGHT: The Power kicks off their home schedule Thursday, April 11, at Appalachian Power Park with a littered slate of promotions. Beginning at 5 p.m., all fans can make their way down to Pugh Furniture to take part in our Opening Night Parade, presented by LM Communications. Chuck and Mayor Amy Shuler Goodwin are both scheduled to make an appearance in the parade that will run from Pugh Furniture to Lewis Street. Make sure to be one of the first 1,000 fans through the gates to receive our 2019 magnet schedule giveaway, while all fans of age can enjoy our new Rock 105 Thirsty Thursday specials, including $2.00 16-ounce cans and 20-ounce beverages. Meanwhile, college students can purchase two tickets for the price of one with a valid student ID at the box office during all Thursday home games in 2019. After the final out, be sure to stick around for a spectacular postgame fireworks show. Gates open at 6 p.m., and first pitch is set for 7:05 p.m. WELCOME TO SEATTLE NIGHT: Put on your favorite flannel, grab a cup of Starbucks and come on down to Appalachian Power Park on Friday, April 12, as the Power clashes with the Augusta GreenJackets. To honor our new affiliation with the Seattle Mariners, we are celebrating all things Seattle with a Mariners poster giveaway and a bunch of Seattle-themed promotions throughout the game. Gates open at 6 p.m. and first pitch is scheduled for 7:05 p.m.
BREWFEST CHARLIEWEST IV: One of the most beloved promotions at Appalachian Power Park returns for its fourth go-around on Saturday, April 13. After the final out of Saturday's 2:05 p.m. first pitch, fans can work their way around the concourse and sample some of the best breweries in the state of West Virginia. For $30.00 online, fans can purchase a Party Deck ticket and receive five craft beer vouchers for use at the festival. New for 2019, gates will open 30 minutes earlier during all Saturday home games, so be sure to get here at 12:30 p.m. Saturday and enjoy a pregame performance by DJ Act Right, as GetGoWV begins their 16 Days of Summer Concert Series at the Budweiser Dugout Bar behind home plate. Also, the Heavy Hitters return for a postgame performance during BrewFest. Feel free to come dressed in your best appropriate Oktoberfest decorum! KIDZ SUNDAY FUNDAY: During all Sunday home games in 2019, kids 12 and younger can run the bases after the final out, courtesy of SMART529 College Savings Program, as well play catch in the outfield before the game. Select Power players will also be available for postgame autographs after most Sunday home games. New for 2019, if you are a member of the Sheetz Power Kidz Club, you can receive free tickets to all Sunday home games from Sheetz. Gates open at 1 p.m. and first pitch is on the docket for 2:05 p.m.
FAMILY BUCK NIGHT: The best deal your family can get is back for another season, starting Monday, April 15! Get box seats for $3.00 or general admission tickets for just $1.00, and enjoy hot dogs, popcorn and 12-ounce Pepsi beverages all for $1.00 each during most Monday home games! Also, there will be an Easter Egg Hunt hosted by the Charleston Police Department. Gates open at 6 p.m., with first pitch slated for 7:05 p.m.
TWO FOR TUESDAY: Enjoy two-for-one concession specials during most Tuesday home games, presented by Rock 105! Specialty items will be announced for each game. Additionally, fans can purchase two tickets for the price of one for all Tuesday home games (All-Star Game not included) only at the Power Box Office. New for 2019, if the Power wins any Tuesday home game, all fans in attendance are invited to run the bases after the game! Gates open at 6 p.m. and first pitch is set for 7:05 p.m.
GRAND SLAM SCHOOL DAY: Wake up early and enjoy some Power baseball! Our series (and homestand) finale with the Lakewood BlueClaws is set for 10:35 a.m., with hundreds of school children from the surrounding areas descending to Appalachian Power Park for a day of food, fun and baseball! Gates open at 9:30 a.m.